Homicide in Hardcover by Kate Carlisle, a Mysterious Review. Homicide in Hardcover spreads itself a bit too thin, trying to appeal to a wide range of mystery readers and never really succeeding at completely satisfying any. Mysteries set in the world of books are always a promising premise. 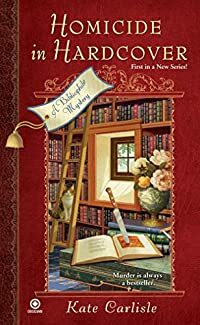 Featuring an amateur sleuth who is also an expert on rare books is certainly not new, but it is basically handled well here (Kate is a bit too sassy, but that's a minor quibble) and the mystery appropriately incorporates a book (in this case, Goethe's jewel-encrusted, gilded edition of Faust) in its storyline. But Homicide in Hardcover also strays into other areas that are often the setting for genre mysteries, wine and art, which, while providing background and color, end up appearing more than a little affected. Then there are the "chick lit" references to shoes, fashion, and dreamy boyfriends that really seem out of place here. Acknowledgment: Breakthrough Promotions provided a copy of Homicide in Hardcover for this review.